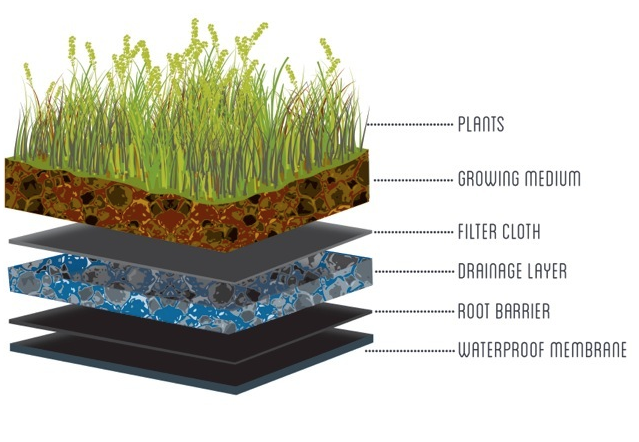 Green Roof Layers and Systems - Restoration Gardens Inc. Green Roof Layers and Systems - Restoration Gardens Inc.
Plants – Restore nature, support biodiversity, keep the roof cool, provide oxygen and much, much more. Growing Medium – Creates a suitable growing environment in an extreme rooftop setting. The engineered mix is composed of a varied blend of organic and aggregate materials. Filter Cloth – Prevents the drains from becoming clogged with organic material and growing medium. Drainage – Ensures the drainage of any excess water off the roof, preventing a waterlogged system or a significant increase in weight. Optional layers include a membrane protection board, added insulation, a moisture retention layer, irrigation systems and erosion blankets. Extensive systems are shallow, consisting of a growing depth of 10cm (4in) or less. Although this system can host a limited variety of plants, it is lightweight and usually requires less maintenance and water usage. Intensive systems are deeper and hence heavier, consisting of more than 20cm (~8in). Depending on the weight allowance of the structure and slope, some intensive systems can even grow trees! Semi-intensive systems are in between the above depths (10-20cm), making it suitable for growing a variety of grasses and wildflowers. Green roofs can add anywhere from 20-100lbs (or more) per square foot onto the total design load of your structure, so ensuring your roof’s design load is adequate is always the first step to building a green roof. 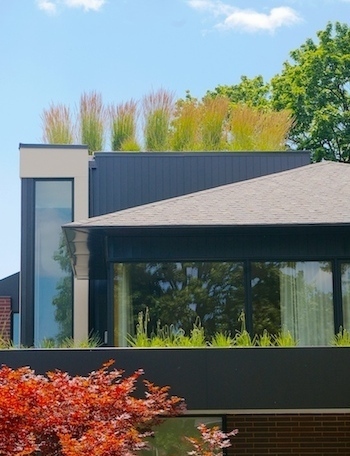 Every green roof is different. The number of layers, depth of the system and therefore plants differ by multiple factors. Some of these may include your roof’s slope, height, sun exposure, wind exposure, weight load, design objectives and/or budget. © 2019 Restoration Gardens Inc.